The wine-like, musty, earthy, woody Syrian latakia is the lead component, and is ably assisted by the other components. In an important support role is the creamy, earthy, woody, mildly spicy, leathery, floral Dominican Andullo. The earthy, woody, nutty, lightly sweet burley is the third most important varietal present. The grassy, earthy, citrusy Virginia takes a back seat in the this blend, though you will know it’s here. The strength is a step or two past the medium threshold, while the taste is in the middle of medium to full. The nic-hit is close to medium. Won’t bite or get harsh. Burns clean and cool and slightly fast with a mostly consistent, richly deep campfire flavor with nuance. Leaves little dampness in the bowl, and needs few relights. Has a pleasantly lingering after taste and stronger room note. Not an all day smoke. Three and a half stars out of four. The matured Virginia and bright Virginia offer some stewed dark fruitiness, some citrus, wood, and grass, a touch of the floral, and a fair amount of rugged earthiness. The very woody, earthy, nutty burley also has a touch of cocoa, cigar and savoriness in a support role. The spicy, plummy, prune-like, tingly perique is just a little more than a secondary player. The strength and taste levels start out at the medium level, and gains a little potency as you go along, settling just below the center of medium to full. The nic-hit is a little closer to medium than it is to mild. Won’t bite, but has a minimal rough edge at times. Burns fairly cool and clean at a slightly fast pace with very consistent and natural flavors all the way to the end. Hardly leaves any dampness in the bowl, and requires few relights. Has a very pleasant, lightly lingering after taste, and stronger room note. Not an all day smoke. I recommend a cob for this. The very earthy, nutty, woody, smoky, minimally cigar-like, mildly cocoa sweet seven year old burley is the lead component. The earthy, grassy, woody, lightly citrusy and dark fruity Virginia also sports a hint of the floral. The strength and taste level start out as medium, but gather potency by the half way mark, and both become a step or so past the medium level. The nic-hit is medium. Won’t bite, but has a mild rough edge at times. A little dry tasting, not very sweet, but filling, and burns fairly cool and very clean at a slightly fast pace with a consistent, natural, hearty, savory flavor from start to finish. Leaves little dampness in the bowl, and requires few relights. Has a pleasant, lightly lingering after taste. Can be an all day smoke for the experienced smoker. The lead component is the very smoky, earthy, woody, wine-like, leathery, lightly musty Syrian latakia. The creamy, earthy, woody, mildly spicy, leathery, floral, seven year old Dominican Andullo competes with the earthy, dry and lightly buttery sweet, floral, mildly spicy, earthy, woody Turkish and Orientals for the second lead. The dark fruity, earthy, mildly citrusy and grassy six year old Virginias are just above being a condiment. The strength is a step past the medium level, while the taste just short of being full. The nic-hit is a hair short of medium. No chance of bite, but does have a rough edge at times. Burns fairly cool and clean at a reasonable pace with a deeply rich, moderately complex, mildly sweet and rather savory, spicy, consistent flavor all the way to the finish. Hardly leaves any dampness in the bowl, and requires an average number of relights. Has a pleasantly lingering, campfire after taste, and stronger room note. Not an all day smoke, but is repeatable for the veteran. I suggest a wide bowl to fully capture the experience. The very smoky, earthy, woody, wine-like, leathery, lightly musty Syrian latakia is the lead varietal. The woody, earthy, smokey, floral, mildly spicy, dry and lightly buttery sweet Orientals and Turkish provide ample support in every puff. The mildly nutty, earthy, woody, lightly coca-ish, smoky burley plays a couple steps below the level of the Turkish/Orientals. The strength and taste thresholds are just past the center of mild to medium, though the taste gathers a little potency as you go along, falling short of the medium mark. The nic-hit is a tad closer to mild than it is to medium. Won’t bite or get harsh, but has a light ruggedness. Burns cool and clean at a moderate pace with a lightly sweet and more savory, consistent earthy floralness from start to finish. Leaves little dampness in the bowl, and needs an average number of relights. Has a short lived, dry, woody, smoky after taste. Can be an all day smoke. The very earthy, muddy, nutty, woody, mildly floral and cocoa-like burley has a bit of ruggedness. The deep cocoa topping takes a little of the lead over the rich sweet rum, and both combine to sublimate the burley to a mild extent. The strength and taste levels start out as medium, but becomes stronger as it goes along, passing the medium thresholds.I rate the strength as medium to strong, and the taste almost reaches full. The nic-hit is close to medium. Won’t bite or get harsh, but has a couple rough edges. Burns cool and clean at slightly fast pace with a very consistent, boldly sweet and savory flavor. Leaves little moisture in the bowl. Requires few relights. Has a very pleasant, lightly lingering after taste. It’s not an all day smoke, and I recommend a small bowl or a cob for this one. The very nutty, earthy, woody, lightly floral burley takes a little of the lead at first, then falls to a supporting role after a few puffs. The woody, earthy, floral, dry, very mildly spicy, lightly creamy buttery sweet Turkish competes with a earthy, woody, wine-like Syrian latakia, the latter just edging out the Turkish in its overall effect. You’ll notice the wood and floral notes more than the other aspects of the Turkish. The grassy, lightly earthy, mildly citrusy Virginia tends to be a condiment. The strength level just pass medium, while the taste is a step past that. The nic-hit is a tad closer to medium than it is to mild. No chance of bite, but there are a couple rough edges. Burns fairly cool and clean with a little sweetness and a bit of savoriness., and slightly inconsistent deep flavor. Leaves little dampness in the bowl, and requires few relights. The pleasant after taste lingers a mite. Not quite an all day smoke, but it’s a repeatable one during your smoking day. The lead component is the very smoky, earthy, woody, wine-like, leathery, lightly musty Syrian latakia. The woody, earthy, mildly floral, lightly spicy, dry, and barely sweet Turkish is a supporting player. The mildly nutty, very earthy, woody, lightly floral, barely sweet burley is the next obvious varietal. The grassy, lightly citrusy, earthy Virginia just rises above the condimental level. The strength and nic-hit are just past the center of mild to medium. The taste level barely reaches the medium mark. Won’t bite, or get harsh. Burns slightly warm and clean with a mostly dry, floral savory flavor from top to bottom. Leaves little dampness in the bowl, and needs an average number of relights. Has a short lived after taste. Can be an all day smoke. Apparently, he has a lot of it. Is the pricing per ounce? Great reviews Jim, thank you. Especially in today's world it's great to find new (to us) talented tobacco blenders that are willing to ship. Aquadoc: they sell them in 50 grams pouches, but I think they sell in bulk, too. Thanks for the detailed reviews. Bottom line, do these blends offer a lot of unique qualities and differentiation from other blends we can easily purchase here that would justify the trouble and expense of ordering them? I think that's a personal decision depending on one's economic circumstances. For example, HU blends are not cheap and you have to pay overseas shipping to get them, but quite a number of Americans have bought them because they are unique and high quality products. I would say these blends are unique in their own right, and are high quality products. Given that until recently, I had never heard of them, I felt they were worth the time to share the information with others. I've purchased around 60 tins or more from HU over the past 4 months. I can appreciate the added difficulty and expense and have no issue with it if the product is worth it. For me at least, HU has been more than worth it. I'll place an order and try a half dozen or so. If they're excellent, worth the effort. If not, I'm only out a little extra time and $150. Looks like a lot of their blends could be very interesting but sometimes that more of a testimony to the person writing their ad work than it is to the actual product. We agree about HU blends. I understand what you mean about ad copy. Antonio, who blends everything himself, writes his own copy. He doesn't sell to shops, only to friends and on the internet. From what I can tell, he's not a young man, but loves pipe tobacco very fiercely. He told me that every varietal is at least five years old before he deems them suitable for mixing. The Virginias aren't quite as sweet as American Virginias, and that as well as the burly he uses sure have some strength and richness. Except for his aros, he doesn't top any of the tobaccos he uses, which I found very interesting. 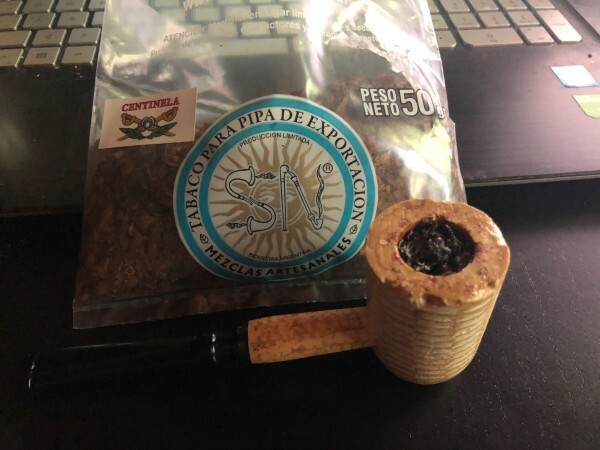 For some, natural tobacco flavors hold a strong interest, and I found his blends to be very good, and many of them very filling. Hope that info helps. You seem to be like me, always wondering about what is out there, and what's it like. I think that's true for the majority of the forum members. That's why I like to pass information on when I can, especially when it's something few of us know about, and let people decide for themselves if what I experienced sounds like something they want to try or avoid. Thanks Jim. Yes, I enjoy trying out new brands. 90% of the stuff I buy is good enough to me to smoke through the tin, so it's not a waste. I enjoy some variety so how else will I know about a brand unless I try it? I'm going to order some blends from Antonio, sounds like they'll be something I'll enjoy. I appreciate the reviews, information and feedback. You're very welcome, man. Let me know what you think when you try them. Tony's work is a labour of love and sacrifice. More than a master blender, he's a pipe smoker, and has been for dozens of years. Everything is done with care and by hand. I want to thank Jim for taking the time to sample the tobbacos, and write such detailed reviews. On a side note, "Oriental Azul" is a favourite SN blend for me, so complex and rich. I strongly recommend it. I placed an order for 6 blends. Looking forward to them. Nice reviews Jim. Sounds like a lot of things going on in each blend. Harris, you need to rent a climate controlled storage space so you can buy more tobacco. As an alternative, you could just have it shipped to me, I'll take care of it for you. Trust me. 2 weeks and a day for the tobacco to make it to my doorstep. Looked like it took awhile to get out of Argentina. The Owner/Blender, Antonio, provided me with very specific instructions of the order in which I was to smoke the 8 blends he sent me and was pretty insistent I smoke them in a cob. LOL Who am I to question genius? 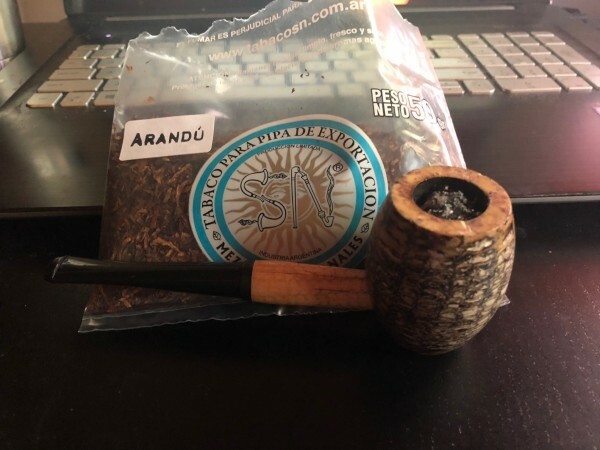 The first blend I tried was Arandu which is an Argentine grown Virginia/Burley mix. The blends were double bagged/sealed. The initial aroma was very musty, much like a box of Cuban Cigars. I found the Burley to be the dominant tobacco, very raw chocolate taste with the Virginia providing some sweetness. Very cool smoking, not sure you could make this bite. The flavor is very, very unique, may take some getting used to but the tobacco is a pleasure to smoke. I'd say around medium on the nicotine. If you're a burley and/or cigar lover, I would think you'd really enjoy this one. Be interesting to see what a couple of years aging does to this one as the burley mellows a bit and the Virginia comes more to the front. The second one I smoked was Centinela (Sentinel). This is a pure, straight Virginia. Pouch aroma was kind of sweet and minty to me, quite subtle. There was a fair amount of peppery spice with the first few puffs, I thought for sure it had some perique in it. But it quickly settled down into a very pleasant, sweet and spicy smoking experience. I don't need any additional bowls to tell that I'll be ordering more of this. Even though this has a lot of the typical Virginia sweetness, the flavor is still quite unique. These two tobaccos have been rather fine cut and will burn very fast. I need to slow down and sip more. This one is so good, that's a bit of a challenge. My shipment took 23 days from Argentina to Arizona. Toni was highly proactive in communicating to me during this time and I recommend that you give him a try. I'm letting my blends marry a bit but I am looking forward to trying them soon. It's nice to see those virgin cobs from the "I'm Not a Pipe Snob" thread being put to good use. Bowl number 3, also in a cob, was Choctaw. This is a VaPer and it's my kind of VaPer. Virginia is the leading component and the Perique is more spicy, plum sweet than peppery sweet. As with the other two, extremely smooth and cool smoking. I like this and would likely buy more. Now on to Regular Mix II. I somehow think Pipestud finally enacted his revenge for me making fun of his beloved Royal Yuck for so long by hijacking my shipment somehow. He poured out the contents of My Mix II and filled it with Royal Yuck. I will admit this got more tolerable as it smoked down the bowl. Or perhaps my taste buds just went numb in self defense. The tobacco is likely high quality like the other blends but the flavor just isn't for me. Good comments, Mssr. Hoosier. They certainly are not your usual blends. Great reviews Hoosier and Jiminks. This tobacco is intriguing. Smoked a bowl of General Mix Manuel Belgrano and Argeus Mix, both English mixtures. I think these two blends really highlight the talent of Antonio. The Syrian Latakia is probably the lead component with the sweet, smoky flavor but not a Latakia Bomb. The other components compliment and step in from time to time. I've no idea what Dominican Andulla is ... cigar leaf? Regardless, I really, really enjoyed both of these blends. Makes me sad that Syrian Latakia has essentially disappeared as this taste is far superior to Cyprian Latakia to my taste buds. Not all of Antonio's blends have been a home run. He provided one blend, Andulla Dominican, that didn't agree with me at all. Still don't know what Andulla Dominican is but when a tobacco blend is has that name, I know I didn't care for it. Doesn't mean someone else wouldn't love it, the flavor simply didn't sit well with me. I sent Antonio feedback on what I liked, and what I didn't. Hope he can make some other recommendations based on that feedback. He's also commented that he has significant difficulty acquiring some of the components for his blends. Regardless, I will try more of his blends and there are 3 of the 8 blends he sent me I will order again. Thank You JimInks and HoosierPipeGuy for these reviews, sounds like unique interesting blends,unfortunately there's no way we can get our hands on these blends due to our never sleeping customs authorities, but thats the life we're in today.